Derde Steen can be worth a mission. There are several peaks. The two main peaks are a left and a right. The left is hollow and fast – very exciting but often crowded when it works. On the right is a mellower peak which has a fastish take-off and then a mellow ride which requires a few cutbacks to stay in the section. It likes a light north-easterly or a south-easterly. Mid and low tides are best here and small to medium swell size. This is the start of Cape Town’s “wild” West Coast. There are no coffee shops or showers here, just a red, gravel parking lot that can make changing out of your wetsuit rather tricky. People mingle and discuss the conditions from the wooden look-out deck on the beach. 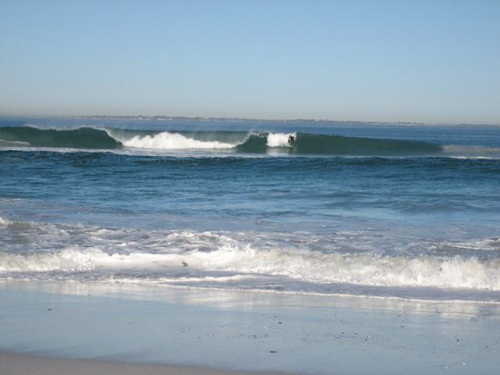 The elite of Cape Town’s west coast surf here and the water is male dominated. Thanks to a selection of shifty peaks the vibe here is relaxed – until it gets to be “big-boy” stuff. Then it becomes quite serious.. Despite the distance from civilization and the cost of a car wash, this place is special when it works. 3 out of 5.